IT’S impossible not to talk about cars and football in Munich simply because the third largest city in Germany — with a population of about 1.35 million — is home to luxury car maker Bayerische Motoren Werke AG (more popularly known as BMW or the Bimmer) and FC Bayern Munich, Germany’s most successful football club. When it comes to cars, nowhere is the foothold of BMW more dominant than in Munich. The sight is evident in a drive through the city streets as well as Germany’s high-speed autobahns. BMW recently hosted a group of international media to the BMW Welt (World) at the Olympic Park in Munich in conjunction with the launch of its first multi-purpose vehicle — the BMW 2 Series Active Tourer. Unlike a typical car showroom, BMW goes out of its way to bring a unique experience to new car owners as well as its visitors who may one day be its customers. BMW Welt features a futuristic building of steel and glass grounded at one end in a typhoon-like tower. The origins of the site, which was once an active airfield, date back to 2000 when it was proposed that a brand-experience and car-delivery centre be built in close vicinity to BMW Group’s corporate headquarters. BMW Welt was opened in 2007. Today, it is visited by over three million visitors annually, making it the most popular attraction in the state of Bavaria. Like its brand, BMW makes walking in the centre look totally glamorous. In the building, there is a display of all current models of BMW vehicles from the BMW, MINI and Rolls-Royce brands on the ground floor to its BMW Motorrad brand of motorcycles on the first. For us, the fascination was the BMW i8 sports car that is touted to be the “ultimate driving machine of the future” and is the range-topping model of BMW Group’s “i” brand. It stands for the “development of visionary vehicles and mobility services, inspiring design, and a new understanding of premium that is strongly defined by sustainability”. We were told that when the first eight i8s were delivered to its new owners, BMW Welt had to be closed. It’s no wonder. This super-sleek half-electric half-gasoline sports car with its upward opening butterfly-style doors, reportedly stole the limelight from Tom Cruise in the Mission: Impossible — Ghost Protocol movie. Still, the new hybrid sports car won’t be zooming from movie screen to any Malaysian showroom so soon. But if looking is not enough, a far better idea is to actually climb into the driver’s seat. One can rent any BMW car product on an hourly basis at BMW Welt. With more adult visitors curious about the technology applied to BMW cars, the BMW Welt also offers a tour about the process of conceptualisation of vehicles and technologies of the company such as their traction systems or hybrid engines. Then there is a Junior Campus, an interactive space dedicated to movement aimed at children aged from seven to 13 years. The centre also offers two restaurants, a bistro and a cafe-bar to keep hunger pangs at bay and give one’s feet a rest as well as a multi-purpose auditorium for up to 800 people, two conference rooms and a business centre, available for the conduct of business events. According to a BMW spokesman, about 85 to 160 car buyers collect their BMWs each day at the purpose-built BMW delivery plaza, of whom 90% are from Germany, and the rest from Austria. Like in the rest of the world, the BMW 3 and 5 Series are its best-selling passenger cars. For those keen to learn more about BMW, head for the BMW Museum next door. From the outside, the BMW Museum looks like a massive bowl. It is connected to BMW Welt via a 265m free-standing pedestrian bridge — the longest in Bavaria. The museum charges an admission fee, which starts from €9 (RM37) per adult to €18 for a family ticket of two adults and three children under 18 years of age. During our visit a 20-year-old BMW 318i — affectionately nicknamed “Percy” was an exhibit at the entrance to the museum. This car is owned by Mike Lomberg, a test driver from South Africa, and has clocked over 400,000km. And it still managed to make its way “home” driven by three of Lomberg’s friends from Cape Town to Munich without major incident. This was especially important to Lomberg, because Percy was the reason why he regained a sense of mobility and independence again when he was confined to a wheelchair after suffering a car accident 24 years ago. We also had the opportunity to see the red classic 1957 BMW 507 that was purchased by the late King of Rock ‘n Roll Elvis Presley when he served in the US Army, which had returned to its birthplace after nearly 60 years, before it was treated to a full restoration. We were told that the roadster had cost 26,500 Deutschemarks back then, but now one goes for an astounding €1 million! 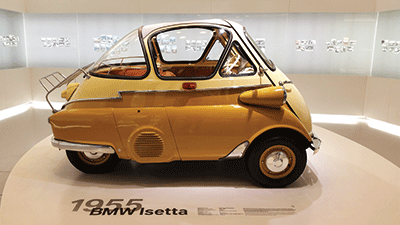 Also on exhibition was the classic 1955 BMW Isetta “bubble” car, which was one of the first cheap people’s cars by BMW. According to reports, BMW ceased production of the BMW Isetta in May 1962, when it launched the new BMW 700. A total of 161,728 BMW Isettas had been built by then. Since then, BMW Group has come a long way. It sold a record 1,963,798 vehicles worldwide last year — a 6.4% increase from 1,845,186 in 2012. Demand is likely to be boosted when the BMW 2 Series Active Tourer makes its debut later this year. Kang Siew Li is deputy editor at The Edge Financial Daily.